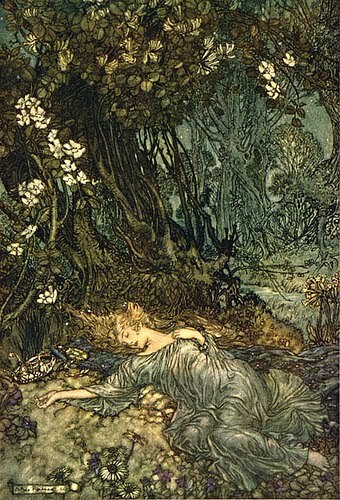 Tonight is Midsummer Night's Eve, also called St. John's Eve. St. John is the patron saint of beekeepers. It's a time when the hives are full of honey. The full moon that occurs this month was called the Mead Moon, because honey was fermented to make mead. That's where the word "honeymoon" comes from, because it's also a time for lovers. An old Swedish proverb says, "Midsummer Night is not long but it sets many cradles rocking." Midsummer dew was said to have special healing powers. In Mexico, people decorate wells and fountains with flowers, candles, and paper garlands. They go out at midnight and bathe in the lakes and streams. Midsummer Eve is also known as Herb Evening. Legend says that this is the best night for gathering magical herbs. Supposedly, a special plant flowers only on this night, and the person who picks it can understand the language of the trees. Flowers were placed under a pillow with the hope of important dreams about future lovers. 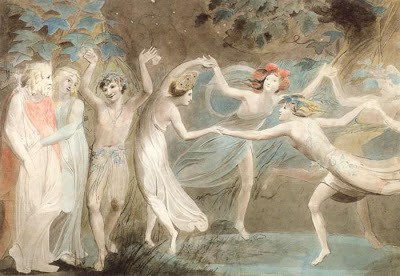 Shakespeare set his play "A Midsummer Night's Dream" on this night. It tells the story of two young couples who wander into a magical forest outside Athens. In the play, Shakespeare wrote, "The course of true love never did run smooth." Thanks to Peggy for sending this over. Now...which is the special plant that blooms this eve so that we may pick it and converse with the trees?